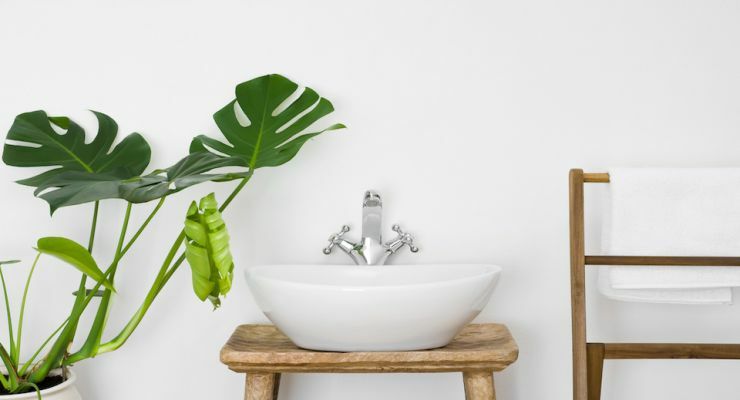 What better way to bring a little taste of the jungle into your home than by adding these humidity-loving plants to an often neglected space…the bathroom. When we think of houseplants, our minds usually go to the living room or kitchen and skip over the bathroom, thinking that it’s just too wet or there’s not enough light for plants to flourish. In fact, if you choose the right varieties, the bathroom can be a veritable oasis for these tropical beauties. If you live in a dry climate and want to try your hand at growing something other than succulents, or just want to bring a relaxing spa-like atmosphere to your bathroom, these 8 plants will not disappoint. It is no secret that ferns love moisture. This particular fern, however, also thrives in low light-environments and will grow big to fill whatever pot it is planted in. Attaching a cup hook to the ceiling and hanging this plant is an excellent way to preserve your counter space while still enjoying vibrant greenery. Spider plants are one of the most popular houseplants and with good reason. These sprawling beauties work double time to clear the air of impurities such as formaldehyde and carbon monoxide. They love humid environments but need at least 6 hours of medium light so the spider plant might not be the best choice if you don’t have a bathroom window. Spider plants are incredibly easy to propagate and make wonderful gifts. Simply place the offshoots in a small pot with soil and they will take root in no time. Aloe vera is one of the few succulents that can survive in a humid environment like the bathroom. Plus, it only requires indirect sunlight and very little care. This plant is one of the best options for a practical, hardy addition to your bathroom decor. It is an exciting plant that not only looks great but works to soothe burns and scrapes as well. Simply break off a bit of the leaf and squeeze the gell on any affected area. This trailing plant is virtually unkillable and is the favorite of many people who haven’t exactly had success with more finicky houseplants. Pothos is extremely versatile and can pretty much be grown in any room in your home, regardless of humidity or light level. If you get tired of it in your bathroom and want a change, this plant will flourish just as well in a bright kitchen or airy living room. Even better, if you are compulsively forgetful when it comes to watering your plants, the pothos will tolerate a little neglect. These intriguing looking plants don’t require soil or water and can be used in a number of interesting arrangements and terrariums. They need high humidity to grow and do best when exposed to bright, indirect light. Get creative with your air plants and use your imagination for unique container ideas. Orchids are often accused of being temperamental and fairly high maintenance. However, the reason that many gardeners struggle with these striking flowers is the lack of a tropical climate. If there’s anywhere in your house that can stimulate the warm, moist air of the tropics, it’s the bathroom. Stick these plants in the windowsill to allow them to receive indirect sunlight and let the warm steam of your shower do all the work for you. No soil or bright sunlight required. Place your bamboo plant in a pretty glass container filled with water and a layer of pebbles in the bottom. Merely make sure container always has water and you’re good to go. Bamboo thrives in wet climates, making this an excellent addition to your at-home spa days. Peace lilies not only act as natural perfume when in bloom, but these plants are also excellent at purifying the air and increasing fresh oxygen. They do best in low light environments where the soil can remain consistently wet, making the bathroom the ideal climate for these beautiful, fragrant flowers. Have you had success growing any other plants in the bathroom? Let us know in the comments below! Hey Buddy!, I found this information for you: "8 Plants to Turn your Bathroom Into a Tropical Oasis". Here is the website link: https://www.tropicalhealth.com/plants-turn-bathroom-tropical-oasis/. Thank you.